Reno’s famous town motto is “The Biggest Little City in the World” and it could not be any more true. There’s a little of bit of everything in Reno. What started out as Nevada’s original “Sin City” has transformed into a city focused on creating its own community, entertainment, and culture. Making its residents think of Las Vegas as just an afterthought. Some people ask “what is there even to do in Reno?” The answer: TONS. Even though it’s basically in the desert, Reno has more community events than you would ever imagine. First and foremost: the Rib Cook-Off. This annual festival is a competition that has been going for over 25 years. It’s guaranteed that you will not find better ribs anywhere else on earth. 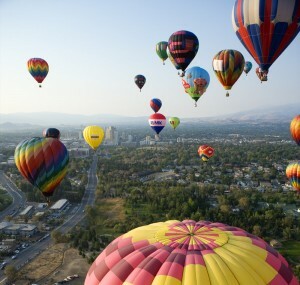 Also, check out the Reno River Festival for music, river fun and kayaking, or just look up into the sky during early September to witness the Great Balloon Race as hundreds of brightly colored balloons float through the sky. And this is only scratching the surface. And for the hikers, campers, and skiers, Reno is as close as you can get to being near Tahoe and the Sierra Nevadas while still living in civilization. If you are a lover of the arts, then Reno may surprise with its burgeoning art community. With over 35 art galleries and many open studios that allow local artists to collaborate and create, Reno is the place to be if you want to be inspired. Also, (another one of Reno’s community events) Reno hosts Artown, a month long arts festival dedicated to showing off local artists at various venues on the Riverwalk. In fact, Reno even supports the arts by law with its 2% for Art Ordinance which requires the city to put forth 2% of the budget of any construction or renovation towards art. The result has been 45 works of outdoor art and over 62 indoors throughout the city. 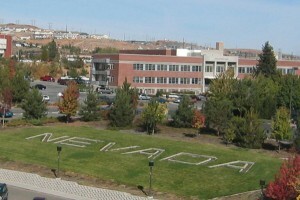 Education is a strong draw for new Reno residents since the city is home to University of Nevada, Reno. The college is located about five minutes north of downtown, and you will find many students living in houses for rent in the surrounding residential neighborhoods of UNR. However, many students end up living near Reno’s midtown since it offers residents walkable access to one of the most exciting, energetic and highly-rated areas of Reno. With Truckee River running through midtown and downtown, countless restaurants and shops, this is a great area that still has plenty of cheap apartments for rent. Downtown is a bit pricier, but the living options are much more unique than your typical homes for rent and multi-family apartment complexes that you find in most of Reno. There are several historical hotels that have been converted into apartments, many offering studio apartments with all bills paid, so that apartment finders can experience living in some of Reno’s historic staples. The benefits of living in downtown include walking distance to the Riverwalk and all of its upscale restaurants and bars, Reno’s many casinos and the live entertainment that passes through the city. While there are pockets of very walkable areas (mostly just downtown and midtown), if you are moving to Reno you are going to want to have access to a vehicle. Getting around on a bicycle is possible, but groceries may be a bit of a struggle. That being said, getting around Reno is actually pretty easy. With McCarran Boulevard circling around all of Reno and Interstate 80 and Highway 395 meeting right in Reno’s center, it’s very easy to get from one place to another in under twenty minutes. Due to inexpensive housing values, Reno is often a destination for those looking to settle down where they can get extraordinary bang for their buck. As such, the city has been expanding. Spanish Springs and Sun Valley, both located north of Reno, are two of the most up-and-coming areas within greater Reno. With the addition of Sparks Galleria and new master-planned communities and luxury apartments popping up, these areas are worth checking out for those that want to be close to Reno. Northwest Reno is also an option worth considering for families moving to Reno due to the highly-reviewed public schools, safe atmosphere and many pet-friendly parks for your kids and companions to roam around. Also, the commute is very easy and there are plenty of shopping centers nearby that make shopping simple. There are many options for apartments in this area, so apartment searching for most families will be a breeze. Reno experiences extreme temperature changes throughout the year. This is both great and terrible because while the summers are sunny and perfect for being outdoors and the winters are great for snow sports, the heat and cold can definitely be uncomfortable. Also, this means that your electric bills will probably be on the more expensive side. Try using an apartment guide (as opposed to Craigslist) to find those utilities included apartments to cut costs. RentLingo is your trusted apartment finder in Reno. We hire local experts, such as former property managers and locators to anonymously tour and consistently rate and review every available place. They share their honest and unbiased perspective with you, so you know how every rental ranks in the area. Because our experts tour every property, we can offer consistent apartment ratings across every region. So unlike finding a Backpage or Craigslist rental, you can trust these apartments are verified and trustworthy: whether it's a cheap studio or a one bedroom with all utilities paid all the way up to a nice house for rent or a luxury condo.